I tried a pair of cobalt blue tights for this tutorial, but you could try any colour! I have very few pictures for this tutorial because I wasn't aware they'd turn out so nice, so sorry for the lack of visual understanding! Firstly, you need to fully soak your tights, and then wring out all of the water. Make sure they're damp, but not dripping. 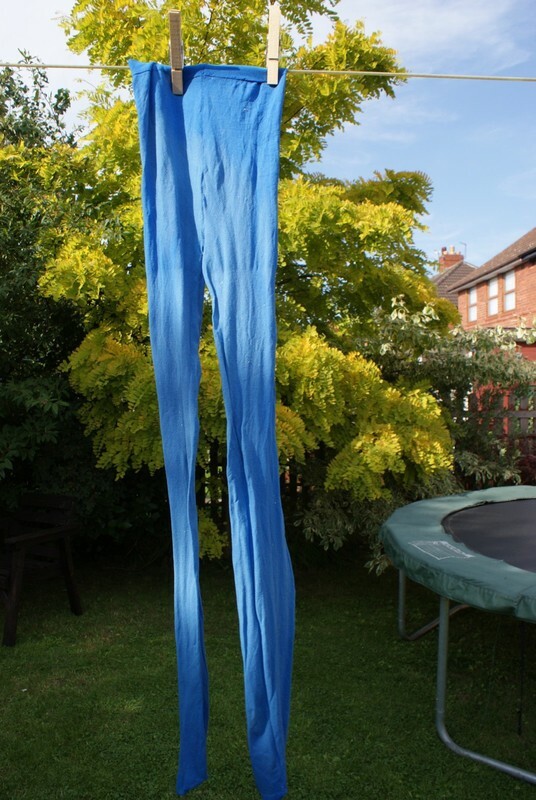 I hung my wet tights out on the washing-line ready for bleaching. The tutorial I took inspiration from stated to put the tights in a bathtub, but bleach can scour the bathtubs enamel way, and we don't want mummy getting mad, do we? Use different techniques to apply the bleach to your wet tights. I tried pouring little bits on and letting it run down, flicking the cup over them to create lines and 'vines'. The toothbrush is to dip in the bleach and 'flick' bleach onto the tights. You can do this by holding the toothbrush at the tights and brushing across the bristles with a finger or two to make it... 'flick'? I even tried dipping my hands in the bleach and scrunching the tights up in my hands. It's really up to you, just have fun. Leave your tights out for atleast six hours for the bleach to fully work it's way around the fibres. 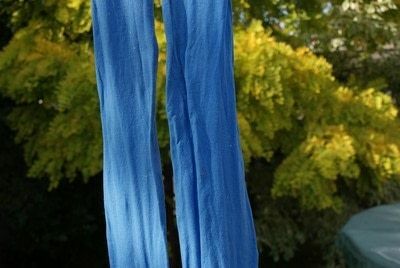 Run the hose-pipe over the tights, or wash them in the sink, before putting them in the washing machine to ensure that no bleach can react with any other clothes. Once.. pre-washed, wash again in the washing machine on a normal cycle. Then remove, and wear to your hearts content! @Rita - yeah, spraying the tights would be a fun idea which would give a cute effect! you can basically use anything you can get your hands on (within reason) to bleach them! on another pair, I tried a squirty Lucozade bottle thingy, and it made them look paint-splattered! @roos a. - YAY! I'm glad someone likes it! hey can you spray the tights with a spray bottle with bleach in it?